Queen are one of the most successful British rock bands of all time with sales estimated to be somewhere between 150 and 300 million. They have won just about every major award possible in the music and entertainment industry. Regularly voted the greatest frontman of all time, Freddie Mercury fronted Queen from 1970 until his death in 1991. The band was comprised of singer Freddie Mercury, guitarist Brian May, drummer Roger Taylor and bassist John Deacon. Between 2004 and 2009 May and Taylor (minus the retired Deacon) reformed Queen with Free and Bad Company singer Paul Rodgers. They played two world tours and recorded one album, The Cosmos Rocks. Since the Q+PL collaboration came to an end, May and Taylor hooked up with American Idol finalist Adam Lambert; a young and talented singer far more suited to Queen’s flamboyant musical output than Rodgers. Queen have been performing sold out shows around the world with Lambert since 2011. There have been no live releases, though fans and critics have raved about them. They headlined the Isle Of Wight festival in 2016 and were regarded as the highlight of the weekend. Some of the band’s decisions post-Freddie have been controversial and not so well-received (5ive and Robbie Williams collaborations) but it seems that they have finally hit the nail on the head with Lambert. 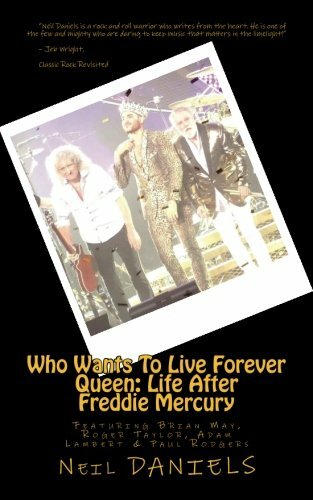 Who Wants To Live Forever charts the band’s musical output since the death of Freddie Mercury.